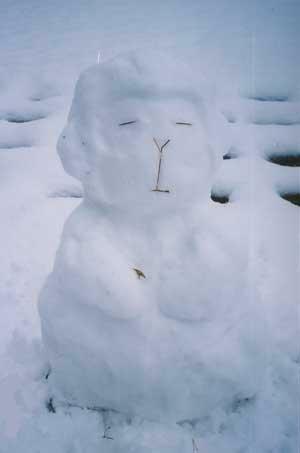 In Japan, monkeys are a symbol of wisdom. 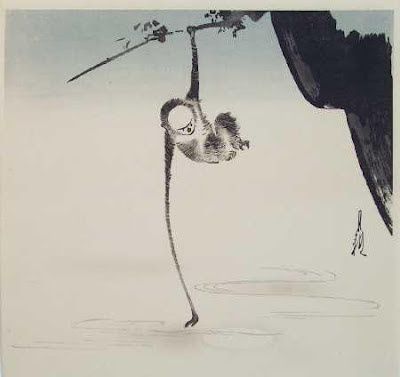 By the time Buddhism reached Japan (mid 6th century AD), the monkey and monkey lore were already common elements in Buddhist legend, art, and iconography. 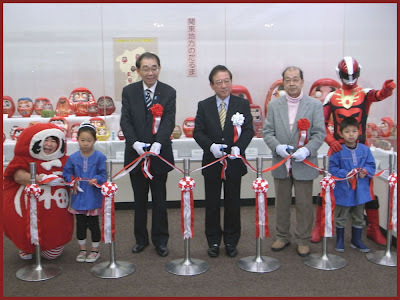 Thereafter, monkey worship in Japan grew greatly in popularity, especially among practitioners of Taoist Kōshin rites introduced from China and among followers of Tendai Shintō-Buddhism, the latter centered around the syncretic Tendai shrine-temple multiplex located at Mt. Hiei (Shiga Prefecture, near Kyoto). Some scholars believe the famous three monkeys -- speak no evil, hear no evil, see no evil -- originated in Japan in association with Mt. 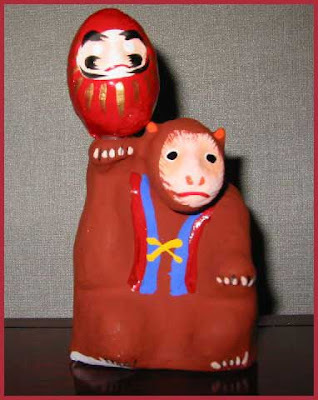 Hiei and the sacred monkey of the Hie Shrine (Hie Jinja 日吉神社; also called Hiyoshi Taisha 日吉大社). Monkey, do not talk ! 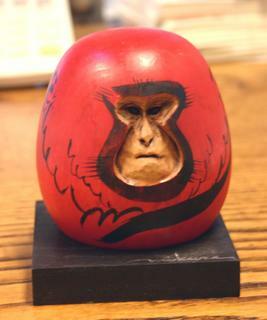 One of the three famous monkeys. This piece measures 3.5" tall. 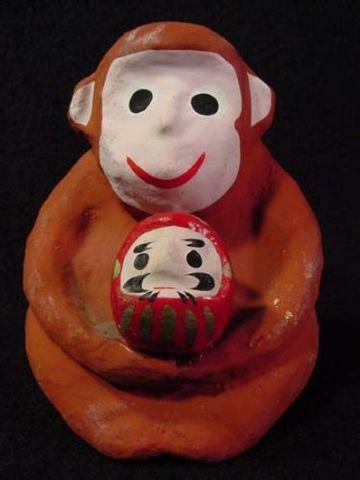 A charming monkey is holding an equally charming Daruma as if holding onto good luck for you. The gold letter calligraphy on the back of the piece reads "Good Luck." The condition of this piece is very good and the age of this piece is from the 1960's. From my friend Tanaka san.
. Hakuin Zenji 白隠禅師 .
. WKD : Monkey 猿　Saru . 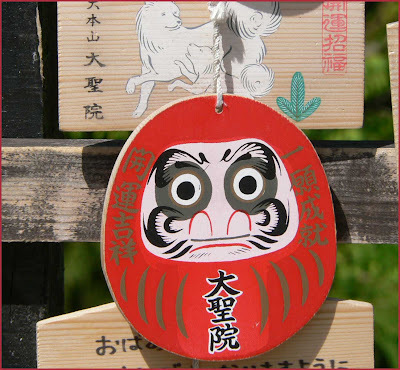 Before introducing the Yakuri Daruma you have to know a little about this temple. It stands on the slopes of Mt. Goken 五剣山 (Mt. Five Swords). Today, the 376.5m mountain does have only four peaks looking like as many swords thrust into it. The 5th peak slid down in 1707 in a big earthquake. These sheer peaks used to provide an ideal place for rigorous asceticism, making Yakuri-ji into a sort of seminary for ascetics. Even today not a few people climb up and down the cliffs by the chains as an ascetic practise. The temple has been founded in 829. According to the history of the temple, before Kobo Daishi went to China to study Buddhism, he climbed this mountain and prayed that his studies may be fruitful and his journey be safe. He made an offering to the guardian god of the mountain by burying eight roasted chestnuts in the ground. When he returned to Japan, he visited this temple again, and saw five swords fall from heaven (thus the name of the mountain) as well as eight trees growing up from the roasted chestnuts. Thus the temple was named "yakuri (yaguri)," meaning "eight chestnuts". 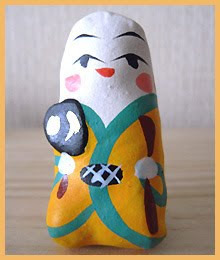 Another attraction of this temple is Kanki-ten 歓喜天, a Buddhist guardian divinity enshrined in Shooten-doo Hall. Kanki-ten, meaning "gods in ecstasy", is actually an elephant-headed god and goddess in an inseparable embrace, a motif of Ganesh of Hindu iconography adopted along with Buddhism. They are believed to share their pleasure with their worshippers, also bringing them marital happiness, family well-being and success in business. They attaract many people when the fire ceremony is performed on the 1st and the 16th of every month, even though they are open to the public only once every 50 years. These papermachee dolls are hard to get and in April of this year, I had asked the owner of the Hisaroku Store if he could get one for me. He was so kind to talk to his doll friends in the area and one person was willing to part with one of his Daruma dolls from Yakuri. 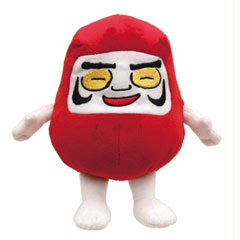 Thank you so much, unknown Daruma friend! 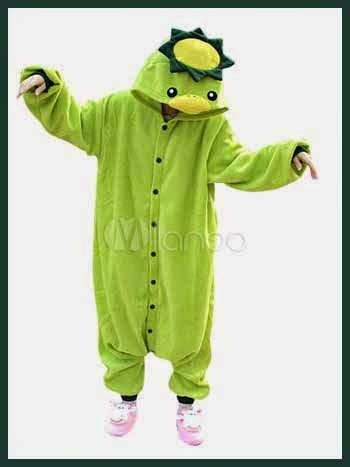 Now I will take the chance to tell you a little more about this one. 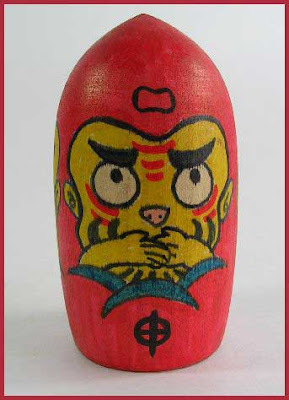 This Daruma used to be made by Mr. Yasuo Urushibara since about 1960 as a talisman for the nearby Yakuri temple, but he died in 1978. The tradition stopped for a while but now the widow, Mrs. Chioko Urushibara, makes a few. This one is about 14 cm high. 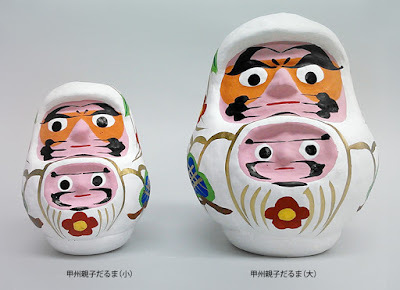 His beard is painted in an individual form with single strokes. His eyebrows are like half-moons facing up, but he has no pupils painted in the white round eyes. On the belly you can see a rendering of Mt. Five Swords. 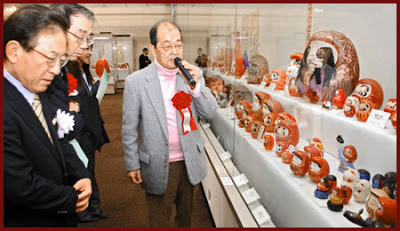 On the bottom the Chinese letters for Chiyo 千代, his late wife, are written. 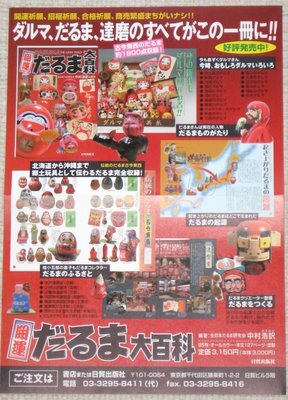 On this HP about toys you can have a look at one Yakuri Daruma on the lowest picture. This one was sold at a store near the entrance of the cable car up the mountain, but now you cannot buy it there any more.
. 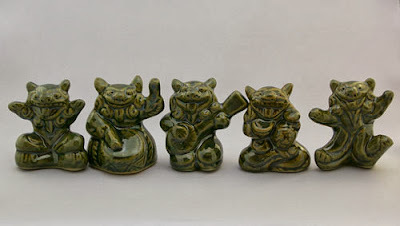 Folk Toys from Kagawa . 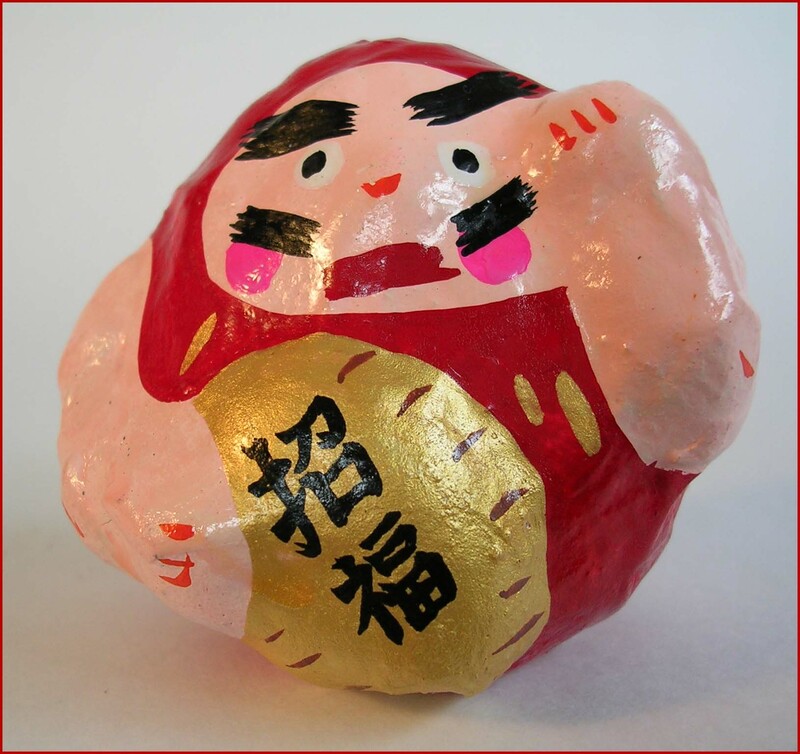 in the local dialect, meaning a "Roly-poly Daruma Doll". shiisaa シーサー enjoying life ! 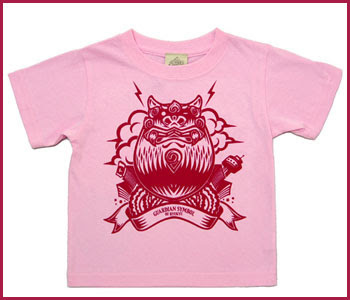 is an Okinawan traditional resist dyed cloth, made using stencils and other methods. 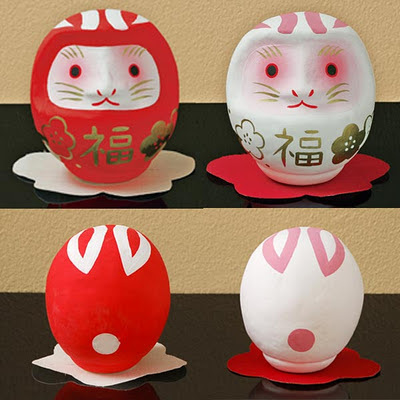 It is generally bright-colored and features various patterns, usually depicting natural subjects such as fish, water, and flowers. Bingata is worn during traditional Ryūkyū arts performances and historical reinactments. Bingata dates from the Ryūkyū Kingdom period (c. 14th century), when the island of Okinawa experienced an influx of foreign goods and manufacturing techniques. It is believed to have developed as a synthesis of Indian, Chinese, and Javanese dying processes. 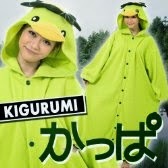 Bingata is a type of stencil dyed fabric originating from the island of Okinawa. 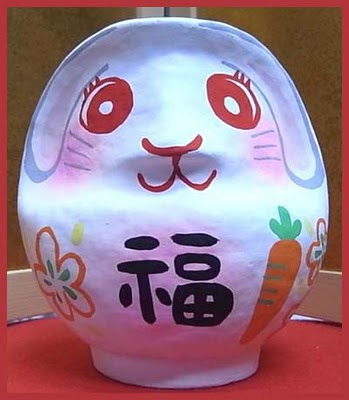 The techniques used are thought to have originated in Southeast Asia (possibly Java, or perhaps China or India) and arrived in Okinawa through trade during the 14th century. The Ryukyu Kingdom "dominated trade between Korea, Japan, China, and the countries of Southeast Asia in the fifteenth and sixteenth centuries". 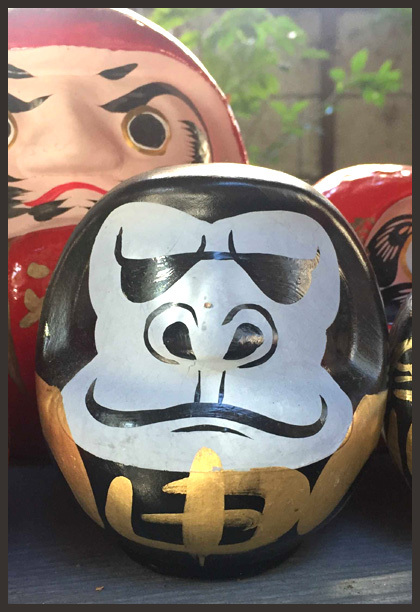 The Okinawans borrowed the technique and created their own nature-inspired designs found throughout the island. The abundant flora and fauna have provided Okinawans with an endless supply of images to reproduce into the artwork called bingata. 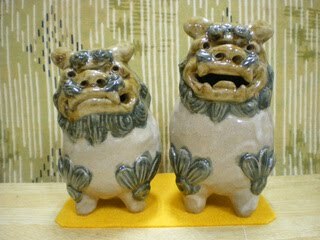 (alternative spelling shishi or shisaa) is a traditional Ryukyuan decoration, often found in pairs, resembling a cross between a lion and a dog, from Okinawa mythology. 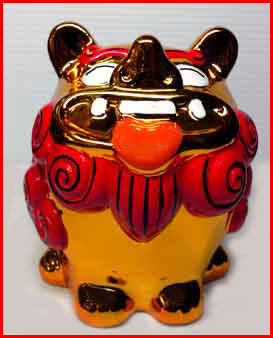 Many people put a pair of shisa on their rooftops or flanking the gates to their houses. 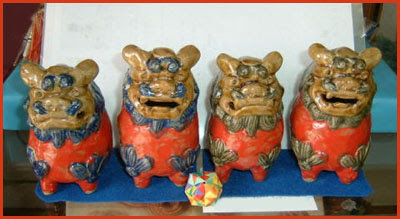 Shisa are wards, believed to protect from various evils. 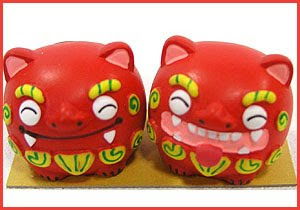 When found in pairs, the shisa on the left traditionally has a closed mouth, and the one on the right an open mouth. 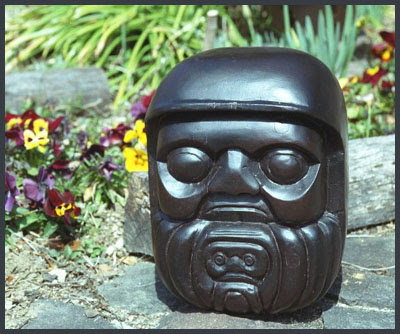 The open mouth to ward off evil spirits, and the closed mouth to keep good spirits in.